As I have said before in other words, the province is nothing more than a piece of patchwork, intersected with pretty boundary lines, so that every nation is stitched in and quilted in spots, without any harmony, or coherence, or general design. Certainly Cozzens was observing more than just architecture; he was also talking about people, language and religion but to zero-in on the built environment and contemplate the richness that was, is a worthwhile exercise. The days of regional influences and traditions associated with our built environment have certainly ebbed but it is important to recognize and celebrate such vernacular because there is always a risk that those who become too familiar with their own community’s distinct attributes undervalue them and unwittingly foster their decline. While attempting to document every minute local tradition is not the goal of this article, I will name a few just in the hopes of whetting as many appetites as possible and perhaps encouraging people to explore what is or was distinct about disparate corners of Nova Scotia. Lunenburg is obviously a great place to start with its British – German origins. 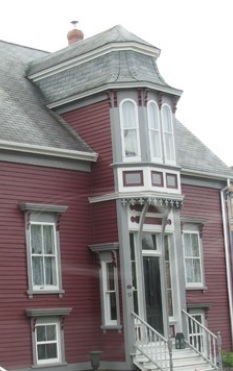 Many structures in Old Lunenburg front right on the street and thereby contribute to the unique atmosphere of the town. The bright paint colors that so often encourage photos of the townscape are nothing new but carry on the long tradition that was noted as early as 1830 when one visitor likened the vivid assortment to the colorful little Dutch toys he used to play with as a child. This contrasts starkly to the Musquodoboit valley where there once existed a prosaic panorama of red structures to the exclusion of all other colors with the intermittent exception of white. Cape Sable Island’s hipped gables, Truro’s spoke brackets, East Hants County’s corner boards designed to simulate stone, Pictou’s real stone buildings built by Scottish masons, company houses in Cape Breton, Yarmouth’s infatuation with hedges and belvederes, Amherst’s red stone, and shiplap siding in various locales all speak to a rich tapestry of architectural diversity within the province. Returning to the south shore, that odd but lovable “Lunenburg bump”, is a great example of how a very local expression of vernacular architecture is well-documented, celebrated and even marketed in such a way that locals and visitors alike feel as though they’re in a special place. What makes your community unique? Identify it. Hold on to it. If it’s lost, get it back. The Second Empire style of architecture has become Hollywood’s “go to” setting for tales of paranormal phenomenon and spine-tingling horror. 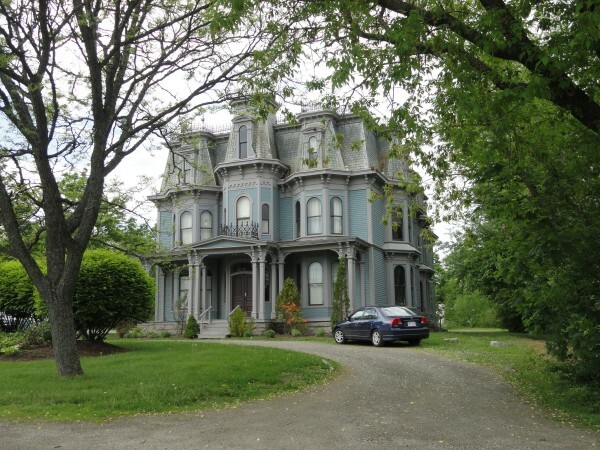 Todd Mansion, found in St. Stephen, New Brunswick, (pictured above) is arguably Atlantic Canada’s greatest example of Second Empire domestic architecture. Had I taken this photo at night with a full moon hanging low over the wrought iron cresting and eerily illuminating the path to the front door, you would instantly expect that I was about to regale you with some sort of scary tale associated with the place. Don’t worry. Even though it is just two days before Halloween, as I write this, I do not wish to contribute to the monstrous body of irrational fears that are already associated with these nineteenth century masterpieces. Still, it is a curious association. When did pop culture first usurp this noble style and twist it into the macabre mansion of faulty electric wiring and secret passages? And why this particular style anyway? I’ll take a “stab” at a few answers. Alfred Hitchcock’s 1960 thriller, Psycho, starring Anthony Perkins as Norman Bates has become so entrenched in our culture as the gold standard of the genre and progenitor of so many horror /thriller stories produced since its release, that everyone knows it – even if they’ve never actually watched it. And the set – the Bates Motel, with that old Second Empire style house looming behind is, I hate to say it, perfect. The choice of house is said to have been influenced by a painting by artist, Edward Hopper (1882-1967), titled “The House by the Railroad” (1925). That house was, of course, a Second Empire house. In 1964, The Munsters aired on CBS. Once again, a Second Empire house was chosen as the set for the creepy characters with the over-the-top Gothic appearance. Similarly, the Addams Family’s Second Empire residence has “endeared” itself to many as that franchise successfully introduces itself to succeeding generations through cartoons, television, movies and video games. Creator, Charles Addams (1912-1988) first brought the family to life with single panel cartoons illustrated for The New Yorker. Perhaps the earliest and arguably the most influential depiction of the iconic haunted house in the Second Empire style is an Addams cartoon titled, Boiling Oil. It appeared in the December 21, 1946 issue of The New Yorker. 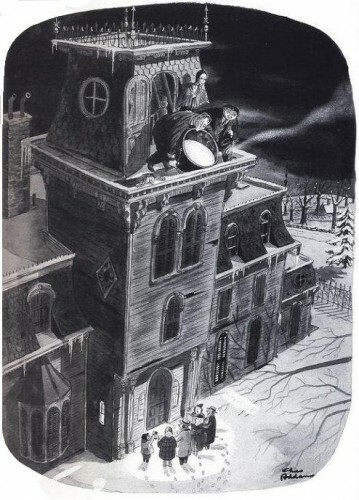 Boiling Oil depicts Addams family members tipping a cauldron of hot oil onto carolers below from the top of the central tower of their Second Empire home. By the end of the nineteenth century, the Second Empire style had fallen out of favour with architects and builders who were busy satisfying new tastes like the popular Queen Anne Revival style. So, by the 1940s, 50s and into the 60s the once fashionable and unique Mansard roof appeared dated. It is perhaps the distinctive roof feature that, more than anything amplified the peculiar nature of the architecture to a point that it became a likely candidate for ghosts and ghouls. Additionally, the iron cresting generally associated with the style is reminiscent of cemetery gates. The often generous scale of Second Empire homes also contributes to the mystery of a “typical” haunted house. And finally, the massing and profile of the style lends itself well to the all important interplay of light and shadow – especially spectacular on dark and stormy nights. Happy Halloween everybody.